China’s overdependence on heavy industry and construction is not only an environmental hazard — it’s a massive financial risk. If there’s one certainty in China it’s this: Just when you think you have something figured out, it will turn on its head. Take China’s energy transition, for instance. In early 2016, the country’s transition to cleaner energy and cleaner economic structure started to look irreversible, with coal consumption falling for two years in a row. Then the government unleashed a massive infrastructure and construction stimulus, lifting heavy industry output and coal consumption. Thermal power generation and steel output, the two largest sources of air pollution and coal demand, grew 10% and 4% in the second half of 2016 year-on-year, and stayed at high level in the first quarter of 2017, with March seeing the highest single-month output of steel ever produced by any country. What’s behind China’s steel surge? As a result of this, progress on air pollution has stalled. Through April of 2017, Beijing’s average PM2.5 levels had increased compared to 2016, reversing 4 years of straight declines, and the lack of air pollution improvements this year have made Beijing’s end 2017 air pollution targets have appeared increasingly unattainable. And this is tied to the rapid increase in debt and inflation of asset bubbles, which have led to a resurgence in heavy industry. The culmination of this industrial resurgence was the release of China’s first-quarter GDP statistics in mid-April, indicating strong 6.9% GDP growth, heavily augmented by a surge in industrial activity, property investment and credit growth. Fixed-asset investment in the first quarter expanded 9.2% year-on-year, beating forecasts of 8.8% growth. Behind closed doors, observers say that the government would maintain aggressive stimulus until the leadership transition had been completed in late 2017, similar to 2012 when a ‘mini-stimulus’ push was used to usher in the Xi administration. 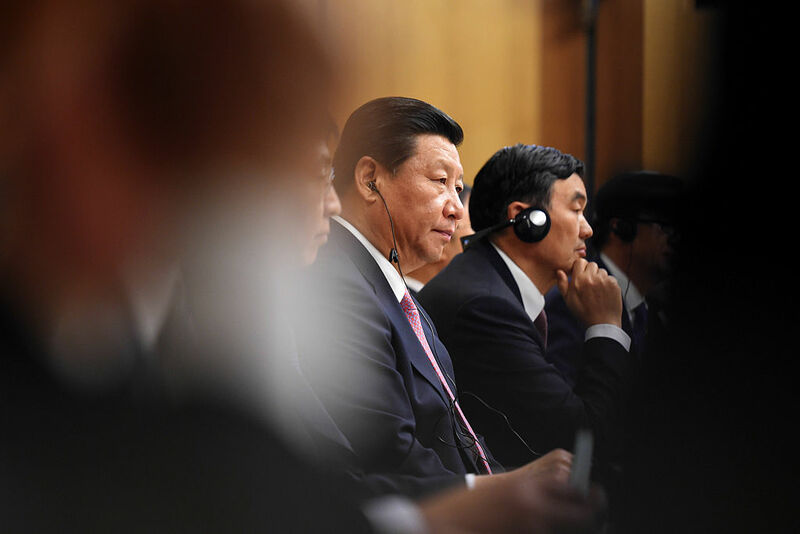 As a result, optimists of China’s reform plans had expected reforms to only pick up pace next year once President Xi had secured the make-up of his administration for the next five years. Those with a pessimistic view, jaded by unfulfilled promises of reform, were starting to suspect they never would. Thus, recent moves by the policy makers rein in credit growth have come as a surprise. The past month has seen the China Banking Regulatory Commission issue a stream of directives aimed at clamping down on shadow banking practices and interbank market standards. Stocks and commodities have all posted losses, while bond yields, which move inversely to prices, have edged up dramatically. Wealth Management Products (WMPs), uninsured financial products issued by banks as a key funding source, and often kept off balance sheets, are among the main focus areas for the government’s drive to deleverage. They have been a key driver of ballooning real estate and commodity prices, which in turn have supported the industrial rebound. The net result of these efforts has clear tightening in money supply amidst rising interest rates. The new deleveraging drive is bitter medicine for China’s indebted smokestack industries, which have enjoyed preferential access to finance for so long. For the environment, however, deleveraging particularly as it relates to heavy industry should result in bluer skies. The vast majority of China’s coal is used for producing metals, cement and for generating power for these industries. Demand for these key heavy industry products, is closely linked to construction demand. Construction volumes are in turn strongly driven by the availability of credit to finance new projects and drive up the prices of real estate. Consequently, growth or declines in heavy industry sectors like cement and steel is closely tied to money supply expansion and contraction respectively. However, while steel, cement and electricity production have gone back into growth, note also the yawning gap between industry growth and money supply growth. While money supply is growing faster than any time since 2011, industrial output growth is still well below 2013 levels. This suggests that the economy is not responding to credit stimulus quite as strongly as it used to, thus indicating how unsustainable it is to rely solely on credit expansion going forward. In other words, with much state-directed spending undertaken without the equally important work of restructuring the economy, China has seen and will continues to see decreasing real returns on capital, unless it pays more attention to the quality of economic growth as much as it has to than the headline quantity of economic growth. China’s oil demand is also exceptionally sensitive to industrial volumes, as most oil is used in heavy industry, mining, chemicals, refining and freight, not for passenger transport. Therefore, except for the refining boom of 2015, oil demand has been intimately linked to monetary expansion. While oil isn’t as big a factor in China’s air pollution issue as coal power and steel production, transportation and oil refining contribute to China’s grey skies. Key commodity prices have tended to react with a lag of 6 to 12 months. We’ve already seen steel prices starting to come down. Based on past experience, coal prices should follow within the next few months if the government keeps up the tightening. Falling prices, falling demand and rising debt financing costs will squeeze coal-burning industries from three sides. Tightening moves in the past weeks are a sign that China’s economic reforms may actually resume faster than expected — and that’s a big deal for the environment.